Aluminum-frame guns are great for concealed carry but harder to master. Lightweight-frame semiautos aren't limited to 1911s. CZ USA's P01, a CZ 75 derivative, has been proven in extensive military programs. Oh, my aching back. After carrying a steel-frame handgun for a day or more, the weight drags on my trousers and pile-drives my back muscles. I don't want to save a few ounces of weight at the cost of my life, but I do want to carry the lightest effective gear possible, and I have found that aluminum-frame handguns are a good value and that they give good overall performance. I won't tell you that an aluminum frame is as durable as steel, or that the handguns are as easy to shoot well, but the trade-offs are acceptable. If you are both practical and serious concerning personal defense, you may come to the same conclusion I have: Aluminum-frame pistols make sense. You simply have to understand the breed, and the shooter must give his or her personal best to mastering this type of gun. Yes, there are other lightweight frame materials such as titanium and scandium, but titanium, for example, is more expensive. And in the classes I've taught over the years, the overwhelming majority of lightweight-frame pistols I've seen have been made of aluminum. Further, aluminum-frame handguns have a half-century service history that's unmatched by any other lightweight gun metal. Practical aluminum-frame handguns were introduced after World War II when aircraft aluminum technology successfully transferred to pistols. For the most part, the first such handguns were adaptations of steel-frame designs. The Colt Commander, for instance, was designed to be an aluminum-frame handgun similar to the Government Model but with a barrel and slide three-quarters of an inch shorter than the GI .45. The pistol weighs 28 ounces versus 39 for the Government Model 1911. The Smith & Wesson Chief's Special was among the first new handguns to be offered in both steel-frame (Model 36) and aluminum-frame (Model 37) versions. These revolvers weigh 20 ounces and 12 ounces, respectively. Before guns such as these were developed, people looking for a lighter carry gun were likely to choose a .32 or .380 automatic (this preceding the development of today's superior .380 ammo) or one of the small-frame .32 revolvers. The first modern aluminum-frame handguns were just as light as or lighter than those small-caliber guns, but, more importantly, they offered the power and reliability of their service-grade actions and cartridges. These handguns make it possible to be well-armed with a degree of comfort, at least as far as carry is concerned. However, due to their light weight, aluminum-frame handguns exhibit more recoil than their steel-frame counterparts, and this increased recoil is the primary drawback. A rule of thumb is that an aluminum-frame handgun requires about 25 percent more practice to achieve the same level of proficiency as a comparable steel-frame handgun. You must understand this rule and accept the fact that you'll either have to practice more or be less capable--and, in my opinion, more shooters are poorly armed due to a lack of practice than incorrect handgun choices. Aluminum-frame handguns demand shooters who actually practice with their handguns. Sharp edges are more noticeable when recoil is greater. When firing a revolver it is common for shooters to receive cuts on the thumb from the cylinder latch. A self-loader's action absorbs recoil in comparison to the revolver, obviously, as the recoil spring brings the slide back smartly and aids in recoil control if the pistol is properly sprung and regulated. A number of shooters have commented that a lightweight revolver bites with the first shot, while the autoloader sneaks up on you. The first few magazines fired in a lightweight 1911 are not uncomfortable, but after a long practice session you will be rubbing your wrists. Be certain your practice sessions are well-spent. Before the advent of aluminum frames, people turned to small-caliber guns such as the Mauser HSc (r.) for comfortable carry. Now, though, there are more powerful, lighter options such as the S&W M42 (l.). If you're a revolver shooter, the single greatest change you can make to an airweight wheelgun is the addition of rubber grips from companies such as Hogue. And, fortunately, many of today's super-lightweight revolvers come with these already installed. These grips absorb a percentage of recoil, and they're more comfortable also because they insulate the firing hand from hard metal surfaces. It is common for the knuckle of the third finger of the firing hand to be rapped by the trigger guard in recoil. Modern grips address this concern, and so does a proven technique. By extending the third finger to a position under the trigger guard, the rap may be avoided and control enhanced. Only standard pressure ammunition should be used in lightweight handguns. Even if the handgun might endure continued use of high-pressure loads, the lack of control from the extra recoil will be skirting the edge of acceptable limits--even for experienced shooters. For the .38 revolver, Buffalo Bore Ammunition offers several non +P loads that make the most of the caliber. The 125-grain jacketed hollowpoint load using Speer's Gold Dot bullet is a good choice at more than 850 fps. With good grips, a standard pressure load and good technique, even the lightest .38 can be tamed. Aluminum-frame semiautos present a longer list of technical and mechanical considerations. GI-type grip tangs sometimes exhibit uncomfortably sharp edges. Modern lightweight-frame pistols are, of course, equipped with beavertail grip safeties. This spreads recoil out rather than concentrating recoil force in one area, prevents the gun from biting the hand and subtly lowers the bore axis. Proper spring technology is also important. The recoil spring should be of the proper weight for the handgun. Keep the spring rating at factory specifications for proper slide velocity. The 1911 is a controlled-feed handgun that keeps the cartridge under control of either the magazine lips or extractor during every stage of the feed cycle, and cartridges that are loaded to around the magic 1.250-inch overall cartridge length feed best. And cycle reliability is best served with 230-grain loads--the bullet weight the .45 ACP was designed for. Winchester 230-grain SXT or 230-grain Bonded Core are excellent choices in my book. It's as controllable as standard hardball in rapid fire, but Pow'RBall offers reliable expansion and smooth feeding and reliability. It's a roundnose that expands by virtue of a polymer ball in a large nose cavity. I recommend Pow'RBall in part due to a problem that has dogged aluminum frame handguns for years: feed-ramp damage. As we examine the phenomenon of feed-ramp damage, understand that longevity and strength are not the same. An aluminum-frame service pistol may have the same service life as a steel-frame pistol. Either will withstand many thousands of rounds of ammunition. But aluminum-frame handguns will not withstand abuse as well as a steel-frame handgun. At one time, ammunition companies produced bullet shapes that required the feed ramp of the 1911 to be modified or throated, and quite a few 1911 handguns were subsequently throated by amateurs--with disastrous consequences. Original design specifications called for a 1/32-inch gap between the frame ramp and barrel ramp. Even more importantly, the slight bump as the cartridge runs across the feed ramp serves to snug the cartridge into the extractor during the feed cycle. Lightweight .45s may be carried comfortably in, say, a Milt Sparks Summer Special, and the shorter Commander is handier, too. Feed ramp polish is not always the answer. Once the anodizing is broken on an aluminum frame, wear often proceeds quickly. A sharp-nosed jacketed bullet or a flat-nose semi-wadcutter bullet could gouge the feed ramp, and while you might dress the feed ramp up once, after that a new frame is called for. Evolution Gun Works offers a steel frame insert that may be used to repair a damaged feed ramp. The installation is not for amateurs but for a skilled machinist. I think we can all agree that this is one job that's best avoided. The best solution is to incorporate a ramped barrel into every aluminum-frame handgun. Kimber has enjoyed great success with ramped barrels, and my Springfield Lightweight Loaded 1911 (which is 25 percent lighter than a steel-frame Loaded 1911) also features a ramped barrel. There is simply no concern about feed ramp damage with this design. With a little attention, you may avoid the major disasters that occur with aluminum frames. As an example, take special care when disassembling an aluminum-frame pistol. If you detail-strip the pistol, the frame may be damaged by prying the safety from the frame. Any time one part is steel and the other a softer alloy, use special care. The plunger tube is another concern. Be certain your grips properly support the plunger tube as per the original design. When you fieldstrip the pistol, snapping the slide lock back into lockup too sharply may stress the plunger tube and cause it to wallow in the frame. I have seen these problems, and they are difficult to repair. 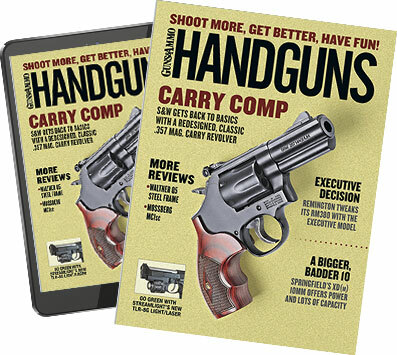 Avoid 10-thumbed handling and your aluminum-frame handgun will stay the course. The bottom line is that the lightweight, aluminum-frame handgun is a great boon to concealed carry handgunners. It has the same power, accuracy and handling as its steel-frame counterpart but at a considerable savings in weight. While these guns require more practice to learn to handle, if they are used for real then the difference in firing comfort will hardly be noticed. You need not sacrifice combat ability for convenience. Aluminum frame handguns have proven effective and are here to stay. You don't get something for nothing. Lightweight handguns recoil harder and therefore take more practice to master.